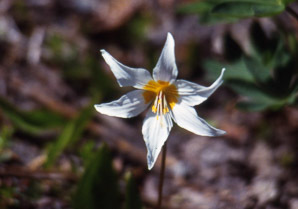 Avalanche lilies are so-called because they bloom almost immediately after the snow melts in the alpine settings where they are found. They flower somewhere between June and August, depending on altitude. These gorgeous flowers are found, often in dense masses, in Mt. 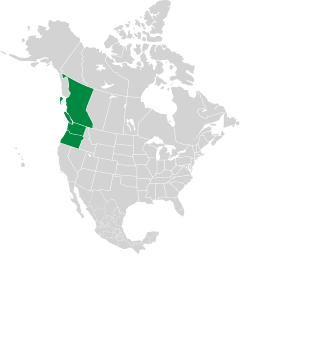 Rainier National Park, Olympic National Park, Vancouver Island, and North Cascades National Park. Identification: Plants are 6-8" (15-20 cm) high, with two leaves emerging from the ground on either side of a central stem. Leaves are 4-8" (10-20 cm) long, shiny, with parallel veins. One to three flowers atop each stem are composed of six attractive white sharp-tipped petals, with bright yellow or orange yellow centers. The white petals often curve backward. Flowers are up to 2½" (6.3 cm) in diameter. Erythronium montanum description by Thomas H. Kent, last updated 2 Jan 2019.